Ah, welcome December! We’re looking forward to a wonderful Christmas season. 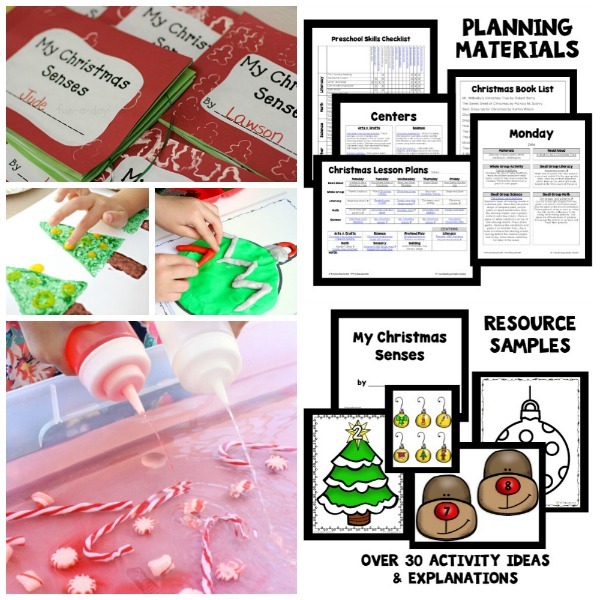 To kick things off, we’re joining with some terrific partners to share creative Christmas play ideas for you and your kids to enjoy this month. The Christmas Play Days series is hosted by Play Trains!, Buggy and Buddy, My Nearest and Dearest, Nothing if Not Intentional, Fun-A-Day! and our site. I know your going to love all of the ideas these lovely ladies have planned. 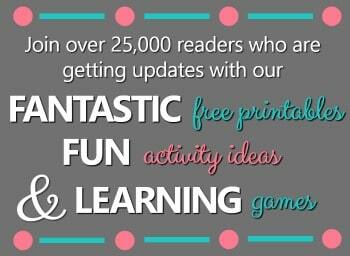 Lovey’s got the crafting bug, so you’ll be seeing a lot of crafts in the coming weeks. 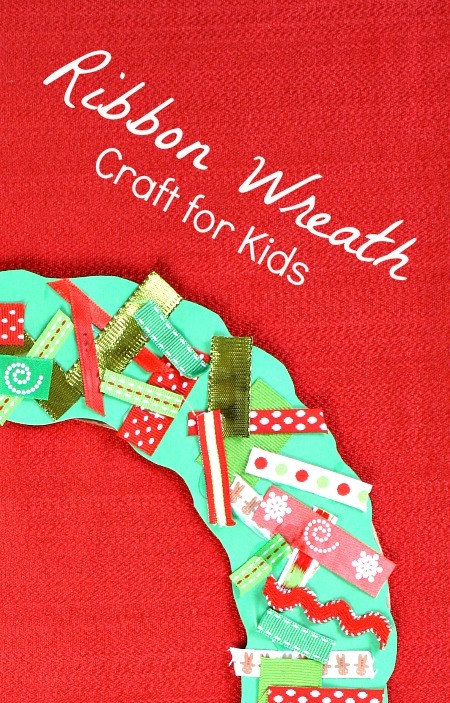 This ribbon wreath craft was an easy invitation to create, and it was even more well loved than I imagined. She spent a long time placing the pieces of ribbon just so, and when she ran out of ribbon she even asked for more. Wreath-We made ours out of a scrap piece of cardboard by tracing two circles (one inside the other) and cutting them out. Then I used green paper to cut cover the cardboard. You could leave it brown or paint it instead. While we had the materials out I made a few different wreaths to be used in other activities throughout the month of December. 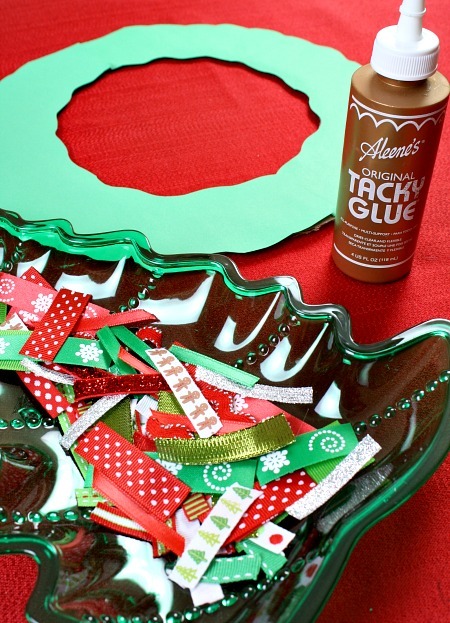 Scrap pieces of holiday ribbon-If you don’t have scrap pieces, we usually find inexpensive spools of holiday ribbon in the dollar bins at our craft store or Target. 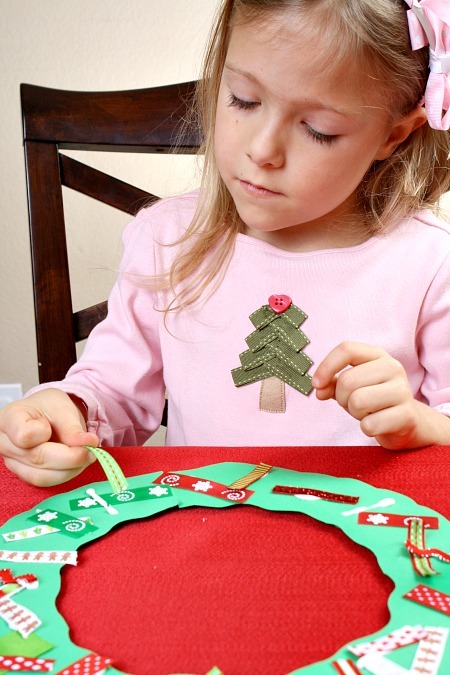 We also save ribbon pieces from gifts that we open and other crafts so that we always have a collection of scraps for crafts or refilling our creation station. There were no specific expectations for this invitation to create. I simply set up the materials and let Lovey create as she felt inspired. She also liked to stop to observe and feel the different textures and designs on the ribbon. She was very focused and intentional about the placement of her ribbon. 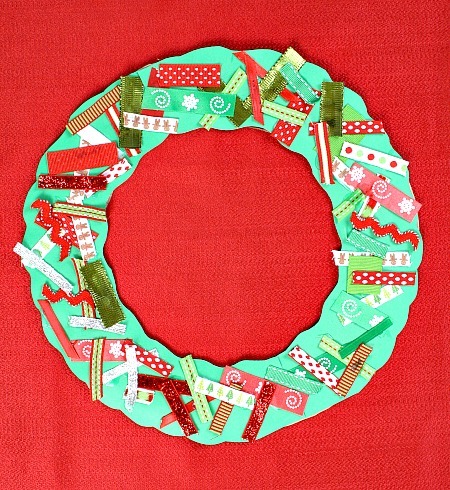 I love how colorful and festive her finished wreath craft turned out. She chose to hang it on the door to our playroom. 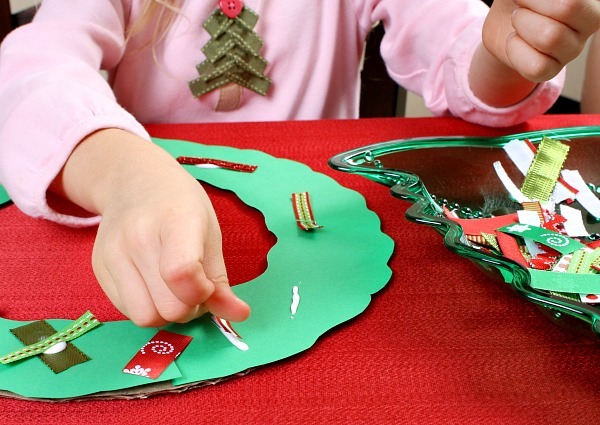 Have you made any wreath crafts with your kids? 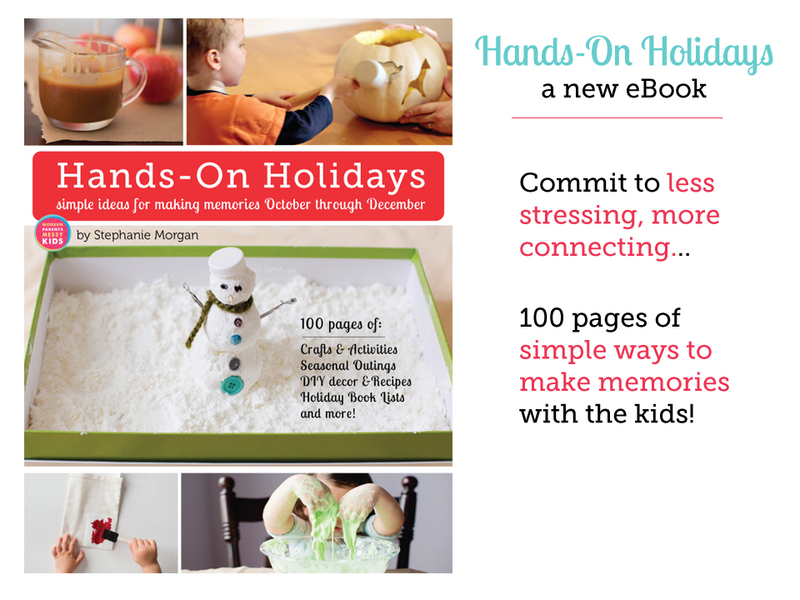 Visit the other sites participating in the Christmas Play Days series to find more fun ways to play this holiday season. Recycled Play Dough Molds by Play Trains! 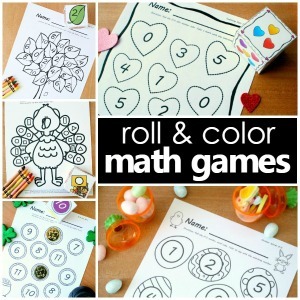 Featuring on this week’s After School round up! Lovely and simple! Thanks for sharing at After School. Love the craft and the engagement of your daughter in it. Thanks for sharing with Afterschool! As Chelsey said, I love that both of my girls would enjoy this! What a great invitation! Really cute, and great for any age! Oooh! Love this invitation! And I really love that BOTH my kids can do it and feel successful! !